Craig Gauvreau is a CRSP (Canadian Registered Safety Professional) with over 20 years experience in industrial health & safety. Craig began his career in the Canadian Armed Forces and served as sergeant in the Infantry. Now as a health and safety leader in the energy industry his no-nonsense leadership and genuine care for his fellow workers enables him to cut to the heart of an issue and move safety beyond rules and procedures. Craig makes safety personal. If making money, is the number one objective of a business, and no profit soon equals no business, and so on. I believe it is only right to expand on the business case for safety. Building on the concept that making money is number one, it is imperative that safety professionals understand, and can speak to the business case for safety. Managers & executives, should ask this of their safety people. It is the fine details I’m referring to, the financial impact on the bottom line, not the concept or ideology of the business case. I believe that most people understand this concept. But my observations are that measuring and tracking the real costs of incidents against the bottom line is rarely done and poorly understood. If you disagree, have a look at your incidents and investigations. Is there an accurate dollar value recorded? If so, how accurate is it? Are the dollar values of incidents recorded on a management monthly report? If so, you’re doing it right. If not, please read on. My thoughts on this idea were proven right when I saw a laser engraved plaque in an office foyer that read, “XXXX Project – On time and under budget”. Now I knew about this project. I participated in an investigation of an incident that that revealed a problem with a critical piece of equipment. The resulting costs added up to approximately $300,000.00. I call the words, “XXXX Project – On time and under budget”, B.S. Something is amiss. How can that be? As I help with investigations, I am finding that the costs of unplanned events are either under reported, overlooked, misunderstood, or just missed in the report. I totally understand that most people do not want to talk about that elephant in the room – the costs of an incident. If you are in a safety role reading this, can you recall the last incident you investigated and what the financial impact was to the company’s bottom line or capital project? Not an estimate, but the actual calculated cost, including using a cost multiplier – that iceberg thing we were taught in basic incident investigation training. Was this cost included in the report? If you are a manager reading this, did you give the cost of the incident to the safety rep? Did they ask? I was in the position of safety manager for a drilling rig company in Alberta a few years ago. We had a major wreck on one of the drilling rigs. It was one of those 3 am phone calls kind of wrecks that pulls you out of a nice deep sleep to wide awake with a racing heart beat and the it was a turning point for me as a safety professional when doing investigations of undesired events. Until that point in my career I wasn’t totally sure I was having the influence & impact with management that I wanted and or needed. The real costs of undesired events and losses was a white elephant that was not talked about. Nearly 15 years later I’m still finding that the real costs of the events are either under reported, overlooked, misunderstood, or often just missed in the reports. The crew had just finished a “slip & cut” task. This means that the traveling block (basically a 150 ton pulley with multiple wheels inside for the cable to travel through) is secured in the derrick and the rig crew slip the drill line (a 1” or 1 1/8” steel cable) through and cut off the worn cable that hoists and lowers the travel blocks inside the the derrick. This raises and lowers the drill pipe in & out of the well when it is being drilled. There is another device called a crown saver that acts as an emergency stop on the drum that rotates and spools up the new cable. It was moved for the slip & cut task. When it is set correctly, it is designed to stop the drum from rotating preventing the travel blocks from smashing into the top of the derrick – the crown. However on this night the crown saver was not reset after the slip and cut. While hoisting up the traveling blocks, the distance was misjudged. The travel blocks smashed into the crown. 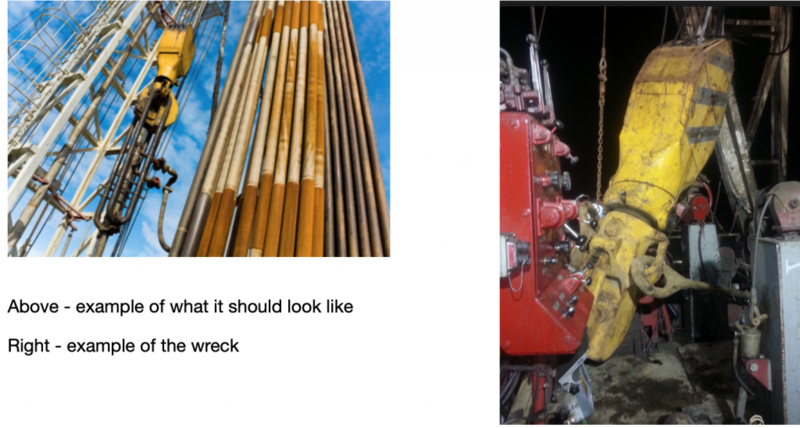 The drill line could not handle the shock load and broke, then the 150 ton traveling block dropped and smashed into the rig floor. It was simple dumb luck that there were no men on the rig floor. It could have been a tragedy. Lives could have been lost. The superintendent and I went to the site and we began our investigation and root cause analysis. While those findings are a story for another day, I want to talk about the costs, the financial impact. After the initial investigation of the accident, I started to calculate the costs. This included the repair costs and down time, the cost to drag the rig off the well bore, and the cost to ship a new rig out to the well site and rig up. The costs were beginning to be substantial. “What do you need that for”, he asked. I responded, “Oh, I’m just trying to figure out how long the rig will have to work for free until the costs of the accident are paid”. It was suddenly very quiet. I looked up at him after scribbling some calculations on a note pad. Now Randy is one of those guys always with a smile and a good laugh. He was not smiling and he was not laughing. I thought I had rendered him speechless. He just pointed at my note pad. His body language speaking volumes. “It will take the entire winter drilling season to pay for the accident. That rig essentially works for free for nearly 3 months until spring break up” I said. This kind of talk with management gets attention. If you are facing some challenges to improve safety where there are accidents or incidents, and high potential near miss events, or get told that safety costs the company money, start gathering accurate information on the real costs of undesired events. Speak to the financial bottom line. Speak the language that business leaders can relate to. Although our job is to help protect the workforce, it is also to protect the company. I am working a white paper with more details on “how to” make the business case for safety. If there is interest, I’ll post it on my web page www.keep-safe.ca. Why do business’s exist? It’s not to be safe – It’s to make money (let’s be real… it is okay to say that). 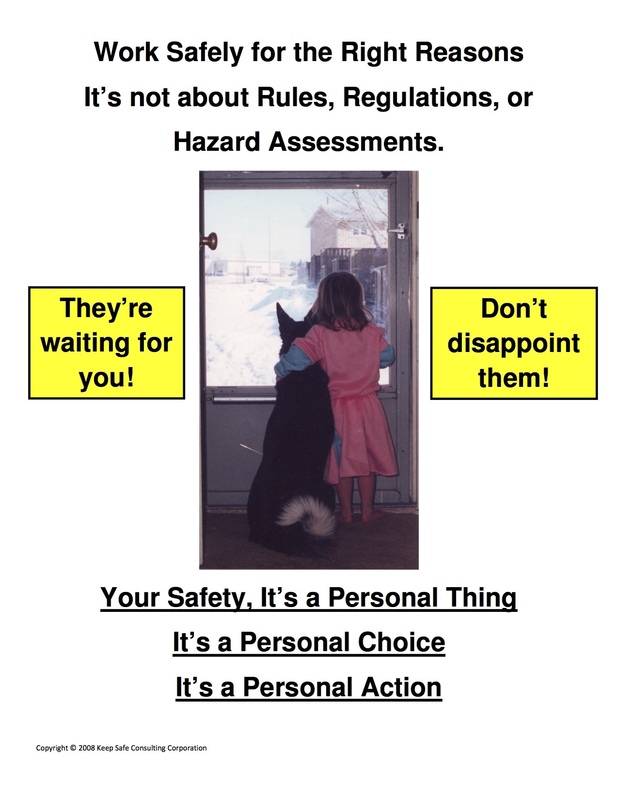 If you’re a safety progressional reading this, please take this to heart, and coach supervisors and managers to stop saying that safety is number 1. If you’re a manager or supervisor reading this, I challenge you to look at your safety messages to the work force. See if your actions with the work force are in alignment with your words. Time and again we see messages from an executive during an orientation video or an executive message at the beginning of the new year with such phrases as, “Safety is our top priority” or “Safety is number 1”. But in this context it is a vague and abstract message. Therefore it often fails to resonate. The message is usually unbelievable because most executives and managers do not realize their behaviour, actions, & direction do not support their words. This is simply a disconnect with the men and women at the sharp end of the sword. I must be clear on something before you read on: I do not believe they are bad people. I know many them and they are good people. I also believe that in their heart of hearts they do not want to see or hear of anyone getting hurt. There is simply a lack of engagement with the workers they hope to influence; Those amazing folks getting it done on the shop floor and at the field sites. After 20+ years of experience in the safety profession, I have come to believe it is generally an oversight on their part by a simple lack of awareness. You can test this if you are a manager or executive, or simply in any leadership role. Ask yourself the name of the last front line worker you talked to. Or ask yourself topic of the last conversation you had with a worker. If you have the answer then hats off to you. That is spectacular because you are on the right track. But unfortunately most will not have the answers to these questions. It is just a simple disconnect. I came face to face with this theory a year or so ago. The work site had just returned to work from Christmas break. I was giving a speech to the work force at an industrial construction site. We called it a “Fresh Start presentation”. The construction was an expansion project of a distribution terminal for LPG (liquified petroleum gas). LPG & was shipped to the terminal by pipeline, then distributed to various other petrochemical facilities via truck, rail or pipelines. In a facility such as this one there is always a focus on “cost”, as there should be. Any business that does not monitor cost will soon be out of business. Every time the facility stops shipping product there is a revenue loss, or a cost which impacts the profitability. My message to this workforce (approximately 120 trades people) at this Fresh Start was “we must stop saying safety is number one”. Now I’m the safety guy, so I got some strange and surprised looks. “Make money” came another anonymous reply. But this time the reply was more of a statement than a question. Then at the back of the room I spotted an unhappy person. He was glaring at me over his glasses, with a deep frown. It was the director of the facility… Oops. It was his turn to give a message. Things went downhill from there. “Well,” he said, and looking directly at me, “I’m one of those management types that does believe that safety is number 1.” He went on to mention that the workers had management support to work safe, to stop unsafe work and that there is no cost put on safety. Yes, those are the right things to say. Well, later that day a truck driver was loading LPG into a tank on his truck. He had a problem with a valve and LPG began to vent. When liquified petroleum gas rapidly expands from a liquid state to a gas state, it creates a white cloud. A white cloud of flammable gas. The security camera showed the worker getting completely engulfed in the gas cloud. He actually disappeared for a moment until the gas cloud dissipated. When the gas expands rapidly it also gets extremely cold. The truck driver sustained frost bite burns to both legs from mid-thigh to just below his knees. No credibility equals no positive influence which equaled no impact for him. This director understands that he must control costs. But at what cost? In the case of the gas release, all work stopped. There was the added cost to the injured truck driver, the cost of getting another driver to move the truck, and the cost of loss production while the facility could not ship product. I know this director and truly do believe that he is not a callous person. He really does care about people. Leaders must understand that their actions speak louder than their words. It is so important for leaders to have a sense of self awareness about their actions, or in some cases lack of action and the impact they may or may not have on the workforce they hope to influence. “You can never talk your way out of something you behaved your way into.” I have said this to many front line leaders. I get the same stunned yet thoughtful silence every time. The safety of our men and women does not need to compromise company profits, but, neither do company profits have to compromise the safety of the men and women. These two things do not need to be opposing forces. We just need to be okay with saying, “we’re here to make money”. But we also need to remember that we can money safely by taking care of our people. We need to get past the idea that safety always costs money. If the safety of our workers is negatively impacting profits, we’re doing it wrong. Period. Challenge the status quo in your safety program. Now I don’t mean being disagreeable just to be disagreeable; I mean take a good hard look at the program and ask if it’s really working. I mean question, for effectiveness, what you do on a regular basis toward and about your safety program. Are the activities and results where you really want them? I mean take a dive into assessing whether your actions and requirements really are having an impact on safety that you want. WARNING this will take some guts and may raise some eye brows when you take the dive. I’m talking about proactive and measurable activities and behaviours that recognize and encourage positive influence on the safe performance of work. I’m taking this approach because, for the first 10 years of my time as a safety professional, I bought the act. I blindly implemented what I was told was the right process or tool to put in place. Now I admit, there was some improvement, but only some improvement. There was only some improvement because I focused on injury rates and measured mainly those results. I talked about reduction of injuries & incidents or celebrated when the number of injuries & incidents dropped. Like most of my colleagues, I measured safety success by the absence of injuries & incidents. Talk about crazy. That’s like playing a game “to not lose” instead of playing a game “to win”. This approach clearly isn’t working. There is still an alarming number of people killed on the job every day/year?. Over the last 10 years, I’ve gone back to my roots of leading men in the army. As a young infantry sergeant, I was taught to recognize the behaviour I wanted to see repeated and corrected behaviour that wasn’t acceptable. The result: a team of excellent soldiers that had each other’s backs. Muster up the courage to ask “Is what I’m doing really – I mean really – giving the results I want,” or ask “am I doing the right things as a leader to influence my people?” Context – If your safety conversations are about the absence of injuries, you’re playing to not lose. Change your conversations so that you’re playing to win. Ensure your expectations are clear and understood with follow up checks. Tune in next week for some ideas and tools to challenge the safety status quo and change your safety conversations.